Apps vs HTML5 – The final answer to the question? 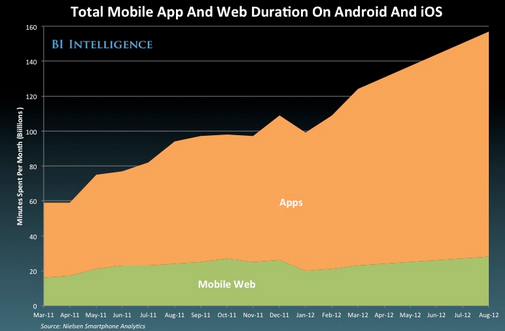 Despite advances in the standard, and the announcement of better and stronger browsers, apps keep dominating. While I have argued before that you really need to account for all possible user experiences (because some times people want Pepsi in a can, sometimes in a bottle), the browsing experience will always play catch-up to the app experience. As devices become more powerful for each new major release by the manufacturers, the quicker app developers are to take advantage of it – but creating extensions to features such as tracking where your eyes are looking are likely never to happen in a browser. Mobile apps are all about user experience – and a superb designer will simply always be able to do a better job in an app than a browser. Tagged with HTML5, mobile apps, Nielsen. The software industry has almost completed a full circle in its cycle from shrink wrapped to Web based and back to native apps with the Web now serving the purpose of distribution platform.